The book will be published by Macmillan Children’s Books in hardback on 18th May 2017. The wonderful cover, designed by the Pan Macmillan Art Department, has been illustrated by Helen Crawford-White, who also designed the covers for my first two books, ‘Smart’ and ‘A Seven-Letter Word.’ The hardback cover will be full wraparound style as the last two books have been and I’ll have more to show you on that soon! 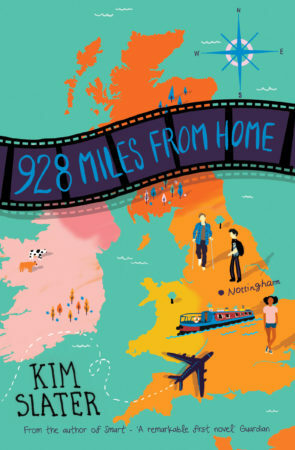 Here’s a little bit about ‘928 Miles From Home’ . . .
Fourteen year old Calum Brooks has big dreams. One day, he’ll escape this boring life and write movies, proper ones, with massive budgets and A-list stars. But when his father invites his new Polish girlfriend and her son, Sergei, to move in, Calum’s life is turned upside down. He’s actually sharing a room with ‘the enemy’! How’s he going to explain that to his mates? Yet when Calum is knocked down in a hit and run and badly injures his leg, everything changes. Trapped at home, Calum and Sergei slowly start to understand each other, and even work together to investigate a series of break-ins at the local community centre. But Calum can’t help feeling like Sergei’s hiding something. Is he really trying to help, or cover up his own involvement in the crime?